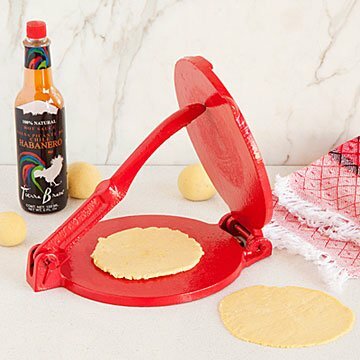 Make and serve tasty fresh tacos with this authentic tortilla press, hot sauce, and warming towel. As with so many foods, store-bought corn tortillas can't compare to fresh ones. Chewy in the middle, crispy on the edges, with a delicious, corn-y taste, homemade tortillas win date night and Mexican-themed dinners. This authentic cast-iron tortilla press, or "tortilladora," provides even pressure, so even beginners can turn out perfect, round, thin tortillas. Mix masa corn flour (not included, but widely available in grocery stores) and water, make a golf-ball-sized ball of dough, put it in the press, and close it. The weight of the cast iron does the work. Open it again, peel off the tortilla, heat in a pan or griddle, and repeat. You don't even need fat! (For wheat tortillas, the recipe is slightly different, but the process is the same.) Wrap the hot tortillas in the Mexican warming towel, and serve with fillings of your choice and the included Mexican habanero sauce. The press's bright red powder coating prevents rust, and won't flake. International foodies will love showing off their own "tlaxcali" (the native Nahuatl word for "maize tortilla"). Designed by Jacquie Lewis and Jules Vertrees. Made in Mexico. Are homemade tortillas truly superior? We set our sights on finding out. Come along for the ride on our blog. Tortilla Press: hand wash and dry thoroughly. Woven cloth: machine wash cold. The hot sauce bottle broke in shipping, but I was refunded for the issue. Other than that, I was very happy with the product! My husband loved this gift. I thought it was a little bit overpriced at almost $50. Solid construction, though! Took a little time to make the tortillas without tearing them, but once you got the hang of it, it worked great. Well made and heavy duty. Great, unexpected gift! This was intended as a gift for the holidays but after taking a peek inside...well, I just might have to have one for myself! Form and function make room for fun and frivolity - fiesta red is the perfect color! This is a kitchen gift I am proud and eager to give! I was given one of these recently and it was a HIT! Our Family have always enjoyed Taco night, but homemade tortillas take it to another level. Super easy and fun to make and they are delicious. The instructions and recipes included in the kit are easy to follow and delicious. The Fish Taco's were the best! !